In Atlantean jail they make you wear Toms brand shoes! And, look! It's Zakris! We finally get to see Nilus' troublesome, usurper cousin! And that's it for Chapter 7! A little longer than we'd originally planned but we wanted to cover a little more ground! Hope you guys enjoyed it! Thanks so so SO much for sticking with us for every page! You are seriously the best, nicest, most kind and understanding and supportive fans and we couldn't do this stuff without you all! We're going to take a little breather to plan out the next issue! We'll announce all over when the next chapter is going to start so keep an eye here, or on twitter, or tumblr. 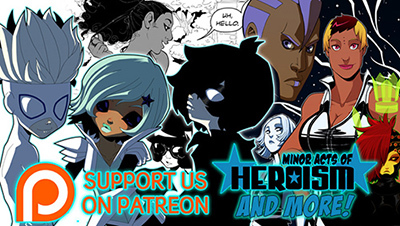 We'll be updating the Patreon with process stuff for the next MAOH chapter as we plan and some stuff from our other projects so check it out if you wanna see cool process stuff! Oh my wow. This is a really powerful scene. Seeing poor Nilus like this is breaking my heart. I hope things turn out alright for her. GUH so excited by all of the recent developments, I love the characters that appeared in this chapter. <3 Great work guys!! The plot has finally thickened so much now that it has just collapsed into a black hole of incomprehensible mystery. Only the power of wild fan speculation can turn it back. B-but ;~; please tell me this doesn't end up in the situation where the King turns into a puppet for the cabinet or something rather :( Poor Nilus . . .
Hugs. Lots of them. Hugs for everyone! Hugs for Nilus because she obviously needs comfort and stability. Hugs for Zakris because he's incredibly attractive with that long hair and is obviously not the monster that he is supposed to be. And hugs for Interpunkt and MissVeryVery for making this beautiful comic! Oh my Nilus!. I was finding this comic and reading through the archive, and had to stop on *this* page... *THIS* page! Gaah!! I'm pretty sure the scroll-looking thing is some sort of gag to stop him (her?) using magic. Is there going to be more? I know that your schedules are hectic and it takes a lot of doing to get in sync for MAOH but when can we expect more? It would really be wonderful to see how Sergio's training progresses, more insight into Simon's relationship with his stepdad, and answers to who is Zakris and what is his relationship to Nilus. Sorry we're being so slow, guys!!! We promise we're working on it, but the next chunk is backstory heavy for all 3 main heroes and it's super hard to sort out to get just right so it's taking us a while! We promise we're working hard though and will announce here as soon as he know the start date for the next part! Thanks so much for your patience and so sorry we are so slow!!! If you want to see some of our progress stuff as we work, check out our Patreon! I am sensing an Itachi???? ?